When the Japanese attacked Pearl Harbor on 7 December 1941, Chew-fen Lee was a high school student who answered to the name Kurt. He had voluntarily associated himself with the Junior Reserve Officer Training Corps (JROTC). In 1944, the 18-year old engineering student joined the United States Marine Corps. Standing barely 5’6” tall, weighing only 130 pounds, Lee made sure he measured up to the high standards for U. S. Marines by working harder than everyone else; he transformed himself into a wiry, muscular leatherneck. After graduating from boot camp, the Marine Corps assigned Lee to Japanese Language School. After graduating from the school, the Marine Corps retained him as a language instructor. By the end of the war, Lee had earned promotion to sergeant and was accepted to attend officer training school. From October 1945 to April 1946, Lee attended The Basic School for newly commissioned Marine Corps officers. Upon graduation, Second Lieutenant Lee became the first non-white officer and the first Asian-American officer in Marine Corps history. At this time, Lieutenant Lee deployed to Guam and China to interrogate Japanese prisoners of war. At the beginning of the Korean War, First Lieutenant Lee commanded 1st Platoon, Company B, 1st Battalion, 7th Marine Regiment commanded by Colonel Homer Litzenberg at Camp Pendleton, California. In late August 1950, the 7th Marines received a warning order to prepare to move out; Lieutenant Lee decided to set an example for other Chinese Americans to follow. He later recounted, “I wanted to dispel the notion about Chinese being meek and obsequious.” He did not expect to survive the Korean War. The 7th Marines shipped out on 1 September 1950; while aboard ship, Lieutenant Lee drilled his Marines night and day on the main deck —enduring derision from his contemporary lieutenants. After arriving in Japan, Lee’s superiors attempted to assign him as a staff officer handling translation duties, but Lee insisted he was there to fight communists and he retained command of his platoon. The 1st Battalion, 7th Marines landed at Inchon, Korea on 21 September 1950. The 7th Marines joined up with the 1st and 5th Marines in their northward movement, forcing the North Korean army into a retreat. Lieutenant Lee and his Marines endured vicious street fighting in Seoul as part of operations Hook, Reno, and Vegas. Subsequently, the Marines were withdrawn from Soul, re-embarked aboard shipping, and made another amphibious landing at Wonsan, along the eastern coast of the Korean peninsula. By early November, the communist Chinese decided to augment withdrawing Korean forces. On the night of 2-3 November in the Sudong Gorge, Chinese forces attacked Lee’s unit. Lee kept his men focused by directing them to shoot at the enemy’s muzzle flashes. Lee single-handedly advanced upon the enemy’s front and attacked their positions one at a time to draw fire and reveal their positions. Lee’s men fired at the muzzle flashes and inflicted heavy casualties. This action forced the Chinese to retreat. Lee, shouting to the Chinese in Mandarin, confused them and at this time, he attacked the Chinese with hand grenades and gunfire. 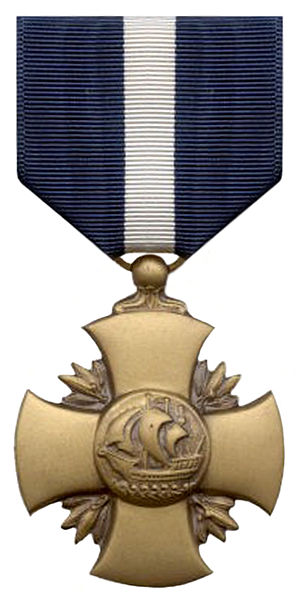 This action earned Lieutenant Lee the Navy Cross medal for heroism under fire. The lieutenant suffered gunshot wounds to his left knee and right arm. Five days later, the hospitalized Lieutenant Lee learned that the Army intended to send him to Japan for recuperation; he and another Marine stole an Army jeep and drove back to his unit on the front at the Chosin Reservoir. Upon arrival, Lee’s battalion commander assigned him command of the 2nd Platoon, Company B. Lee commanded his platoon while his arm was in a sling. Late on 2 December, Lieutenant Lee was ordered to spearhead a 500-man thrust against the Chinese forces in an effort to relieve a vastly outnumbered Fox Company, 2nd Battalion, 7th Marines at a place called Toktong Pass —a strategic location controlling the main road to the Chosin Reservoir. Lee’s platoon, weighted down with heavy equipment, advanced through -20° temperatures and under limited visibility due to blizzards and darkness. Lee’s battalion commander, Lieutenant Colonel Ray Davis, had no special instructions for Lee—other than to stay off the roads and avoid heavily defended roadblocks. 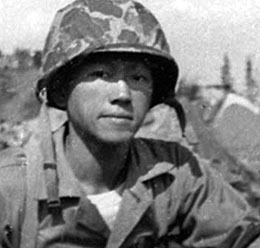 Lieutenant Lee placed himself at the point of his platoon and used only his compass to guide the battalion in a single file over treacherous terrain. Suddenly, heavy enemy fire pinned Lee down below a rocky hill. Refusing this delay, Lee directed his men to attack the hill with “marching fire,” a stratagem used by George S. Patton in which troops continue to advance as they apply suppression fires against the enemy. Upon reaching the rocky hill, Lee and his men attacked the Chinese in their foxholes. Lee, with his arm still in a plaster cast, shot two communists on his way to the apex of the hill. When he reached the top of the hill, he saw that the Chinese foxholes were all constructed facing the other way, where the Chinese expected the Marines to attack. The foxholes were all empty, however. Lieutenant Lee’s attack had driven the Chinese into retreat. Following this success, 1/7 established communications with Fox Company and Lieutenant Lee led Baker Company forward in an attack that forced a path to the beleaguered Fox. During this attack, Lee received another wound in the upper part of his right arm, above his cast. Undeterred, Lee regrouped his company and led them in several more firefights against pockets of enemy resistance. On 8 December, a Chinese machine gun wounded Lee seriously enough to end his Korean War service. 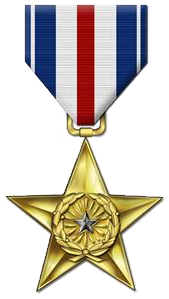 Lee received the Silver Star medal for his attack against superior numbers of Chinese regulars. For his wounds, he received two Purple Heart medals. Major Lee passed away at his home on 3 March 2014. He was 88 years old. Semper Fidelis, Major Lee —I have admired your courage and your example to all Marines.